Fall Into Fun: Autumn means adventure at Springdale Farms in Cherry Hill. Not only has John Ebert lived on the Springdale Farms property since he was born, but his lifelong passion for the family business has deep roots. Though hard to imagine now, Cherry Hill’s sprawling homes, schools, shopping and attractions were all once farms, orchards and pastures for lifestyles that reflected much more of a rural personality. Among them, Ebert’s family-run farm was thriving. Today, as Cherry Hill’s last remaining working farm, Spring­dale Farms continues its strong tradition into its 63rd year, Ebert says. All year, the 100-acre farm attracts hundreds of customers and is a popular destination for patrons to purchase fresh, seasonal produce—like herbs, lettuces, peppers, eggplants, corn and 12 varieties of Jersey tomatoes—as well as breads, cakes, muffins and seasonal pies baked daily. Fresh Jersey tomatoes will be the key ingredient in September’s Pie of the Month, tomato pie, Ebert says. They’re not just a produce stand, though. 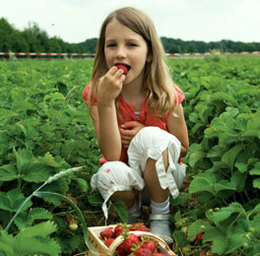 The farm entertains visitors with educational family attractions all year. This autumn, farm guests will enjoy the popular corn maze, a favorite of Ebert’s for more than 10 years. If viewed from the air, Springdale's corn maze this year reveals the image of a locomotive. And while inside it’s nearly three acres, maze-goers will come across a variety of puzzles to solve while learning about our area’s early railroad history for a roughly hour-long adventure. "The theme is primarily about the early railroad period as it pertains to Camden County, specifically about the line and station that stopped here at Springdale Farms,” Ebert says. The maze is primarily open on the weekends, Saturday and Sunday from 10 a.m. to 4 p.m. Though there are dates for Flashlight Fridays: Sept. 14, 21 and 28, and Oct. 5. For this unique and exciting experience of the corn maze, visitors are required to bring their own flashlights. Tickets will be $10 for teenagers and adults aged 13 and up and $8.50 for kids ages 4 through 12. Guests 16 years and younger must be accompanied by an adult. Supervision is limited to five children/young teens for every adult. Each of Springdale’s attractions is suitable for visitors of any age. The farm is excited to be moving into its most popular season and treating guests with additional activities such as the corn maze and hayrides. Springdale’s weekend hay­rides include a “quick pick,” stopping off at the pumpkin patch where guests can handpick the pumpkins they’d like to take back with them and purchase at the end of the ride. During the week, the hayrides are more educational in nature, Ebert says. School groups can take a tour of the various crops, while staff explains more about each vegetable and the farming and harvesting involved. This season, the groups will stop and learn about broccoli, cabbage, lettuces and corn. For adult groups of 20 or more, nighttime rides include a two-hour excursion, ending with a campfire where guest will roast marshmallows or grill hotdogs on an open flame under the nighttime sky. Private parties taking place under the outdoor tent, patio areas or in the beautiful glass conservatory can also hop on these hayrides as a unique closing to any special occasion. All that Springdale Farms has to offer will culminate in a weekend-long Fall Festival, in partnership with The Garden State Discovery Museum. Visitors to the farm on Sept. 29-30 will be allowed access to the best of what both destinations have to offer. For a single ticket, admission will be granted to either location for hayrides, the corn maze, a petting zoo, pony rides, pumpkin picking/painting, and all the museum’s exhibits and activities. The farm has a commitment to locally produced and consumed products. With this motivation, they’re continuing their tradition of charitable giving. Springdale Farms works as a food drop-off location for Philabundance, the region’s largest hunger relief organization. In addition, the farm also supplies the Food Bank of South Jersey, part of Feeding America. Guests who’d like to help are asked to donate fresh fruits and vegetables that are left over from store purchases or extras grown in home gardens. The donations can be dropped off at the farm on Saturdays before noon. Published (and copyrighted) in Suburban Family Magazine, Volume 3, Issue 7 (September, 2012).